Amazing stuff Ynnead, 100% characterful as always. Love it! 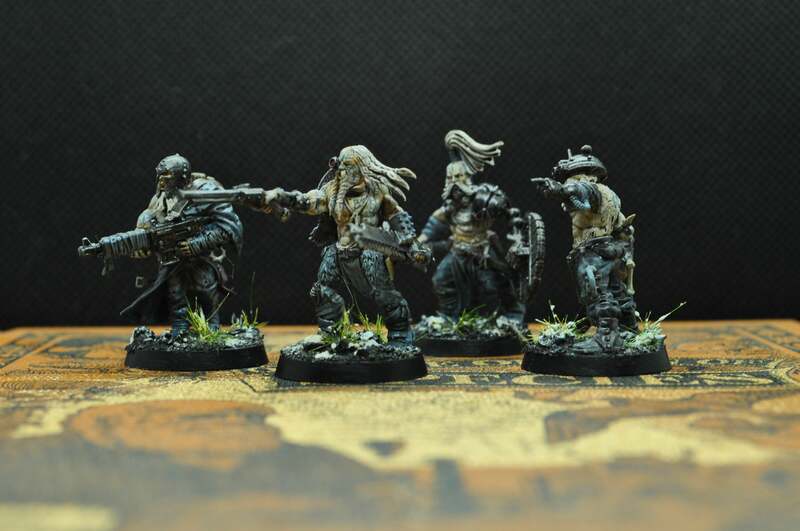 I'm amazed by how 1 model can really change the aesthetic of a gang. The new Snake Cult members look great...but the one guy with the staff makes them come across as far more intelligent and noble. He totally changes how I view the war band. Maybe that's what you were looking to do, maybe it isn't...but it's a striking effect either way and I think the range looks better for it. I really need to make some scenery for these guys to live in. It's definitely on the list. Out of interest, what paint to people use for painting scenery? It can't be the little citadel pots or you'd spend £20 per square foot just in paint! Feth, that's a wargor. Bad news. Sixteen hundredweight of muscle, steel and anger. Once was a time they were all as such. A time of blood and the ruin of worlds. The elk-men who inhabit these forests are the sons of cowards who fled rather than fall on the battlefields. Every so often the old blood percolates up from the deep. So that's a wargor I've been wanting to push things a little further with the chaos-influence on my elk-men. Even though they've largely been abandoned by their gods, I'd imagine the mutagenic effect on their bloodline would linger like a curse. Once a servant of the Gods, always a servant of the Gods. For all eternity. Wonderful stuff as always, Ynnead, I think this Elk-men band is one of my favorites. Keep it going! Just amazing realizism. The smooth conversion work and the mute color palate, so real. Never cease to amaze. Thanks guys! Really pleased you like them the elk-men are some of my favourites too I've got a few more ideas for them, just need to collect the bits. Speaking of next batch, here's the first lot! By blood, they're mostly Fenrisian. Descendents of kaerls and soldiers posted as garrisons, or just too slow to make it back to the landers when the crusade left. They're littered all through the Fenrisian Wilds like so many spent casings. Not sure about anyone else, but I find it helps to make the Poor Bloody Infantry of a warband first as a grounding point to then leap off the edge with weird and wonderful gribblies (more of those coming soon!). Great stuff, Ynnead, are my eyes playing tricks on me or are those Skaven Shields that you're using(Might be Rohan too)? They fit really well! I really like the subtle tattoo / war paint on the shirtless guys, not sure how you can work with detail that small, but super nice touch! "They're littered all through the Fenrisian Wilds like so many spent casings." This short sentense alone paints a picture of such magnitude it's unbelievable. I can almost see the endless bleak tundra and the lost souls inhabiting it... It smells of wet earth, melting snow and smoke of campfires. And those models just bring the picture to life. Those doggies look amazing, and the narration that goes with them? Micky blessed Mouse! Have a lot of catching up to do on your blog, mate, but what a start. My first look in for months landed on your doggies. It was meant, I tell ya! Good to see your work again, bloke... Pointy ears forever!! @SeekingOne Ooh I love that description nail->head. Bleak tundra, lost souls, the smell of wet earth and woodsmoke and the sound of an axe being sharpened by the fireside. Perfect you get a fair few post-apocalyptic deserts and wastelands, but seemingly few frigid and shadowy boreal forests. I stumbled upon some mood music the other day which took me on a dive through some stuff that just fits perfectly: 1 2 3 4 5 6 Oh, and an awesome new instrument I hadn't heard of, the taglharpe. @Saim-dannGood to see you back dude and good timing plenty more of these guys coming! Virskr gazed out into Ginnungagap, the yawning void between stars. He remembered well the whispering, gnawing hunger that clawed his mind from that abyssal place. With clenched teeth he steeled himself against his fear. 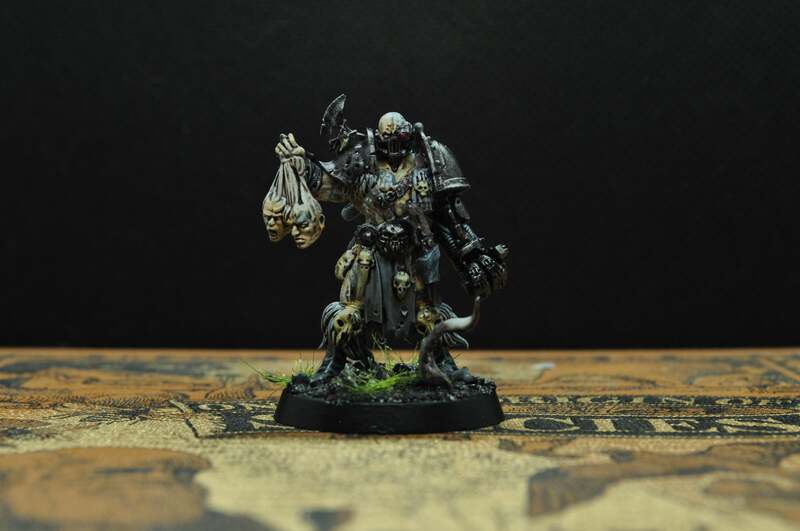 His gods demanded service, and he was oathbound to obey. 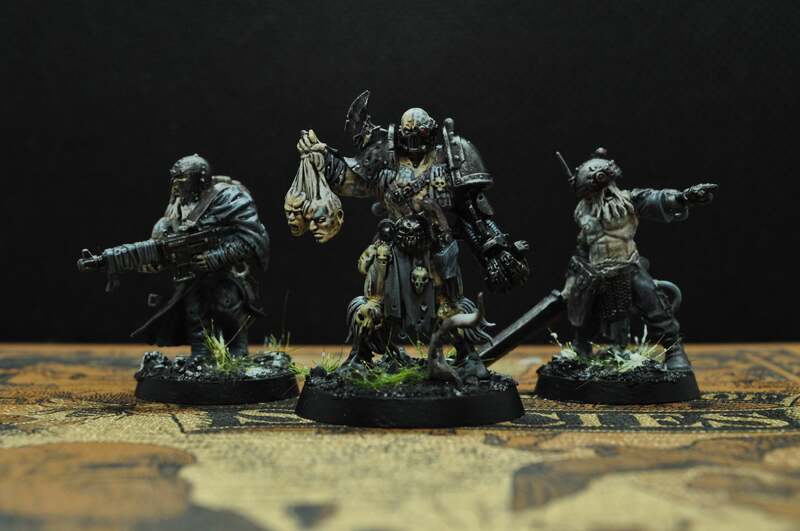 Excellent as usual, Ynnead, I absolutely love that warband leader! He's got a lot of character, and that's saying something when all of the other minions have that in plenty . The jarl towered over his followers. You could certainly see how he came to power. The man was a mountain. People say his mother was an ettin...and looking at him I could almost believe it. Dead pleased with this guy. I bought the chieftain a while ago and made a jarl out of him, but just wasn't pleased with how he turned out. Turns out a head swap to something more inhuman, toning down the warpbeast pauldron and giving him some heads to hold was all it took to bring him up to scratch! Even the bolt pistol converted into a rifle tells a story of this mungrel mob... Be well! Just can't help pointing this out... 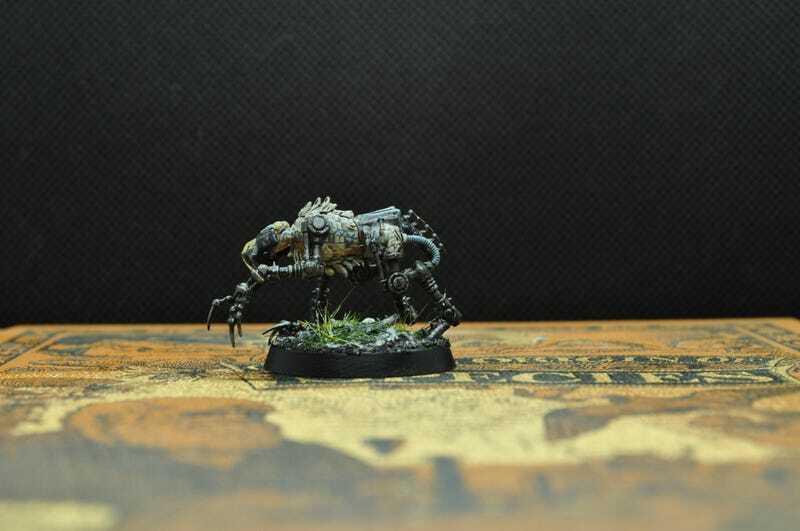 Since the moment I started following you Ynnead, your miniatures have always been unbelievably characterful. But these latest ones, they are something more. 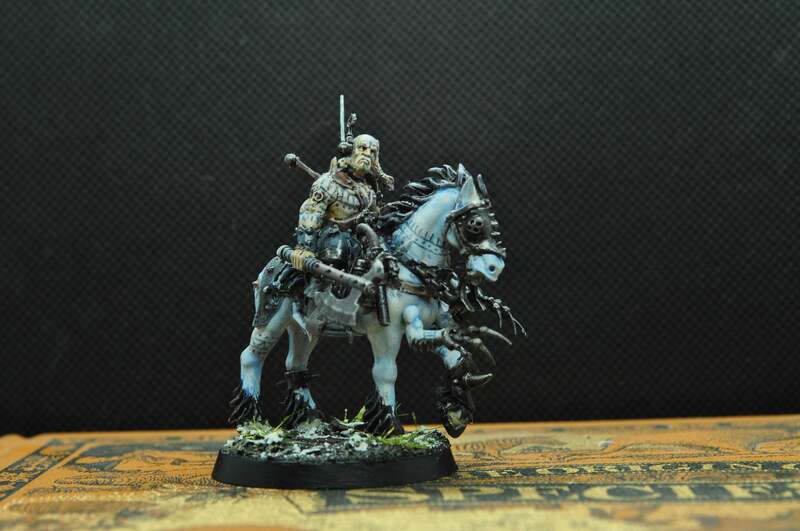 I mean, there are a lot of minis out there, some of them are cool, some are beatiful, some are gritty and realistic - but yours are in a different league entirely. They are characterful, and their character is imbued with so much compressed meaning it feels almost palpable. I can (and do) stare at your photos for minutes, and the picture just keeps unfolding. Being able to imagine a world is cool enough, but imaginig a world that actually feels alive - now that's an accomplishment. And you manage not only to imagine, but also to express it, using laconic yet incredibly precise strokes of minis and lines of text to confer that feeling of being alive to a viewer. That's nothing if not high Art, as far as I'm concerned. Yeah, I'd say that guy is definitely the Alpha of this pack . 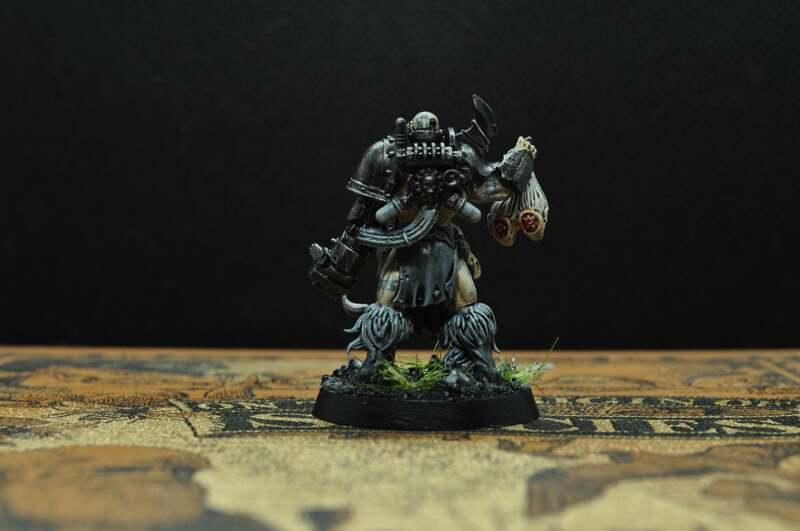 He's boss, Ynnead, I think my favorite part is the fur tufts and skulls on his boots, I think that's a great touch. Also that mechanical fist looks great too. That's one hell of a compliment SeekingOne I do put a fair bit of effort into researching, writing, rewriting and just thinking about the background and world these guys inhabit. Really pleased it's paying off! 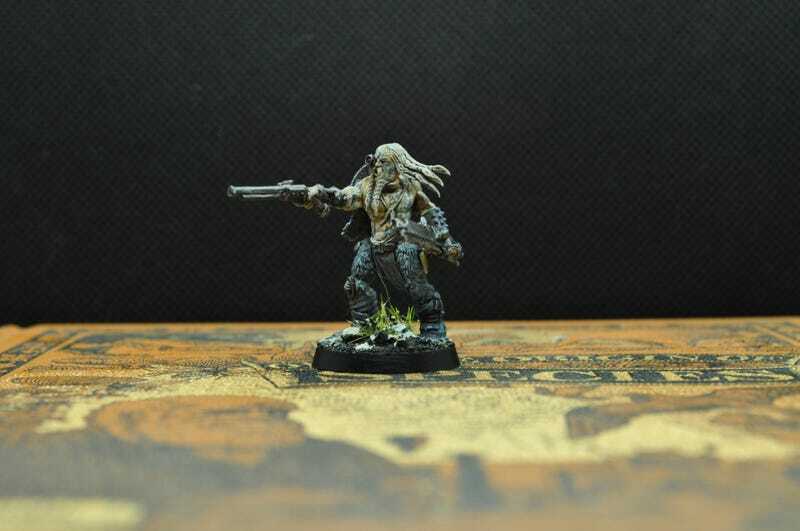 The rifle's actually just a straight bit from the Chaos Cultists kit. They're a bit trickier to kitbash than some older kits as they're not as modular arms/legs/body/head being separate. That's our Ulfsark. Men who have dedicated themselves wholly to Morkai the Animal God. Men who have stripped their minds and bodies of all that was once human, such that they might better understand their patron. I forget you're an utlaending. That's a sleipnir. Quite common around these parts. 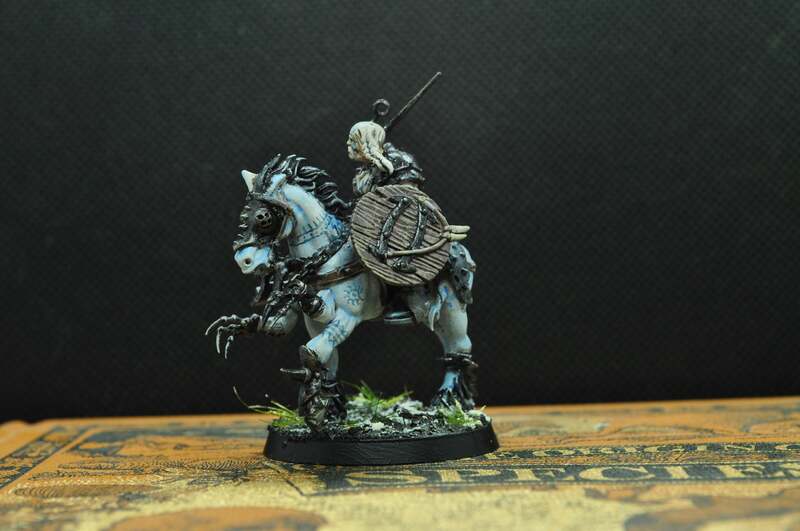 Fenrisians, both kearls and wildlings, use them for scouts and warhorses. wow, more outstanding work, well done. Love the arms on the horse . More glorious additions, Ynnead. I second Mage's opinion about the Sleipnir, it's quite majestic in an ominous-twisted kind of way . 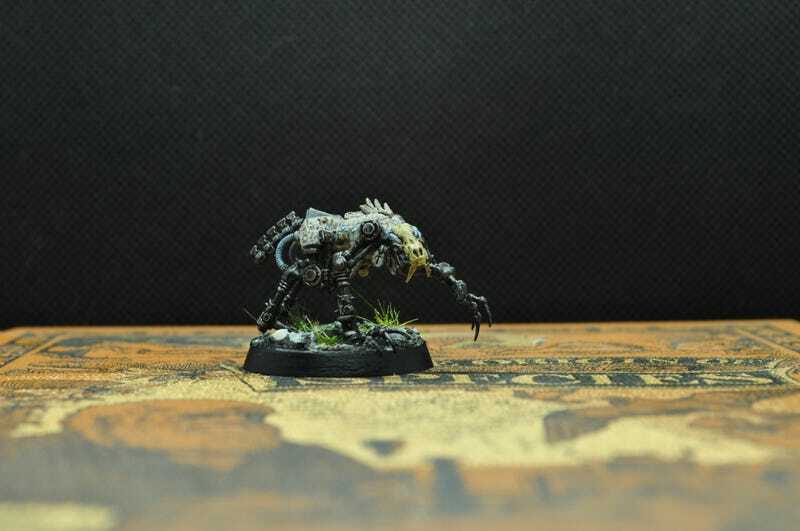 I think the Robo-Wolf is great too . 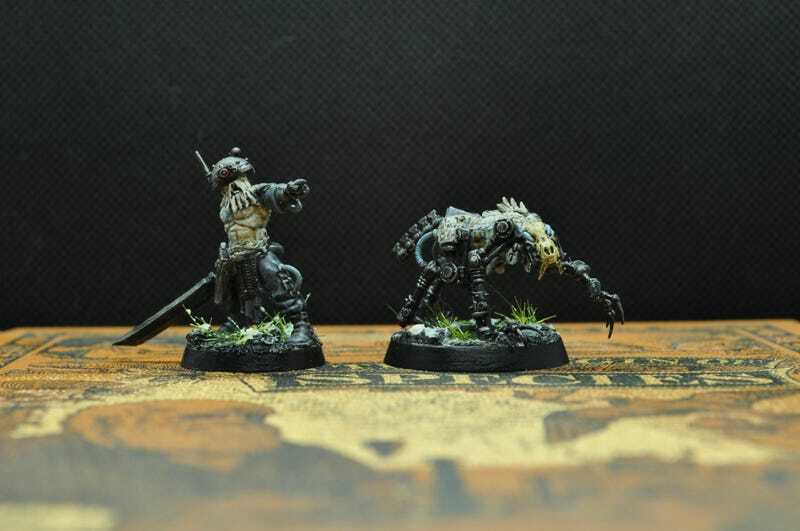 Nice use of skitarii parts! I love the, I think, genestealer arm on the horse too. Beautiful color on it to and the tat work is perfect. I also like the molf. Great kit bash work as well as paint.